A Well-Designed Grocery Shopping Trolley That Includes Very Special Features! 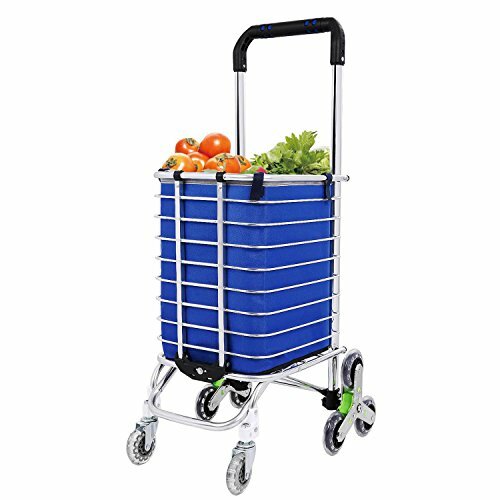 --- Our trolley can be used for an endless variety of situations such as shopping at farmers markets, flea markets, groceries, and malls. Perfect for carrying heavy things especially when climbing the stairs. Allow you to roll the cart up steps and curbs with the utmost ease. Save your energy when pulling the grocery cart or climbing stairs. It keeps your goods safer and won't worry about get wet and become bad! MEASUREMENT: Total Height: 93 cm/ 36.6 inches; Wheel Diameter: 21 cm/ 8.3 inches; Shipping Bag Size: 40 x 31 x 29 cm/ 16.9 x 12.2 x 11.4 inches; Folding Size: 93 x 39 cm/ 36.6 x 15.4 inches (H x W). STAIR CLIMBING CART: There's nothing worse than the added weight of your cart when hauling goods upstairs or downstairs with a poor constructed cart. Our engineers design this cart especially for the elders, the people who has back problem, women in pregant and so on. WHEELED SHOPPING CART: Front 360 degrees swivel wheels for easy steering; Back 3-wheel for moving smoothly through a variety of terrain including sidewalks, streets, store aisles, grass, etc. EASY TO STORE: Collapsible frame for converting into a lightweight dolly to transport large items. when not in used, it can fold up to be compact, perfect for keeping in your trunk, pantry or garage! Say goodbye to your cumbersome, clunky shopping carts. MULTI-PURPOSE: Not just for transport laundry, groceries, camping gear or gardening tools. It is variously used for office files, suitcases, bottles of water, sports equipment, beach gear and kitchen supplies with its premium tri-wheel design and spacious space.